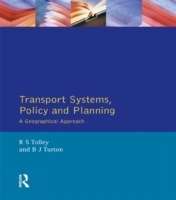 Provides a unique review of the major spatial aspects of transport systems, a detailed analysis of transport problems in urban and rural areas, an evaluation of social and environmental impacts, and a planning and policy overview. Divided into four parts, each considering a different aspect of transport geography. The first part outlines the basic geography of transport and examines transport and spatial structures, focusing upon the varying contributions made by transport to industrial, agricultural and urban development. Part two moves to consider specific transport systems at both national and international scales, drawing on studies from industrialised and developing nations and discussing the effects upon transport of the political changes in the former USSR and Eastern Europe. The third part examines some of the many problems of transport and urban and rural areas using specific examples to illustrate the contrasting difficulties and evaluate current urban transportation planning methods.